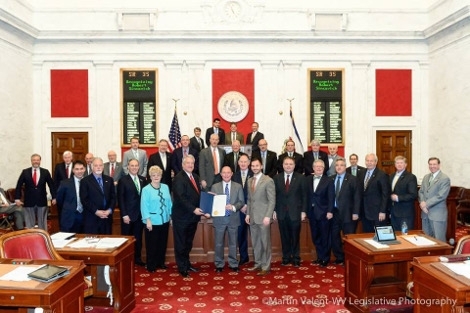 Caption: Rob Sincavich, president, Team Sledd, Wheeling, WV, (front, center) is recognized by the West Virginia State Senate for assuming the chairmanship of AWMA and his service to the convenience industry in West Virginia. The award was presented by WV Senate President & Lieutenant Governor William Cole III. The West Virginia state Senate and House of Delegates both passed a special resolution Thursday, Feb. 19 recognizing Rob Sincavich, president of Team Sledd, Wheeling, WV, for being named chairman of the American Wholesale Marketers Association (AWMA) and for his service to the convenience distribution industry in the state. The resolution, which passed both chambers of the state legislature unanimously, noted that Sincavich will assume the chairmanship of AWMA at the AWMA Marketplace & Solutions Expo in Las Vegas next week. It pointed out that he is two-time past president of the West Virginia Wholesalers Association, a board member of the Ohio Wholesale Marketers Association, and chairman of the Mid-Atlantic Legislative Conference relating to convenience distribution issues. The resolution noted that Team Sledd has grown from a company with less than 30 employees with $3 million in sales to more than 260 employees with $560 million in revenue over the past 30 years. It pointed out that Sincavich and his business partner, Randy Emanuelson, purchased Sledd Company in 1996 "and have built it into today's Team Sledd, a top 25 United States convenience wholesaler." Sincavich will present his Chairman's address to the industry Wednesday, Feb. 25, during the Expo's opening session at the Paris Las Vegas Hotel & Casino.